For more than a decade, Stemulite has been the go-to all-natural stem cell supplement used by professional atheletes and every day people like you. It's a supplement formula that works for athletes and those of you that are not very active. As we get older, our body slows down and you begin noticing the changes. You're likely feeling these changes now. Chances are, if you found us here today, you're experiecing this now or beginning to notice differences in your body. You begin to lose energy, strength, endurance, muscle and many report not sleeping well. For those of you that are active, the change may be more subtle. None the less, all of you will come to this crossroad in your life. The safe solution to reverse this trend is Stemulite. 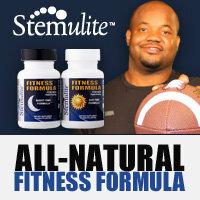 Stemulite products are patented all natural high potency wellness, quality of life fitness supplements. They are designed to provide fitness oriented individuals and couch potatoes alike with specific fatty acids, amino acids, proteoglycans, enzymes, antioxidants, alkaloids and mineral supplementation for maximum sustainable results. This product is a binary dose (AM & PM) designed to take maximum advantage of the body's natural circadian rhythms, truly a sports fitness supplement. Although Stemulite works best with moderate to intense exercise regimens, it is also very effective for the less active individuals giving them that extra edge naturally that just may get them out of that "couch potato" category. Research shows that this product improves metabolic function, cellular repair processes and protein synthesis. The ingredients of Stemulite, often misspelled Stimulite, possesses antioxidant properties which eradicate toxins present in the body and thereby improve the immune system and stimulate your own bone marrow to produce new adult stem cells that are transfered throughout your body via the blood stream repairing damaged cells. 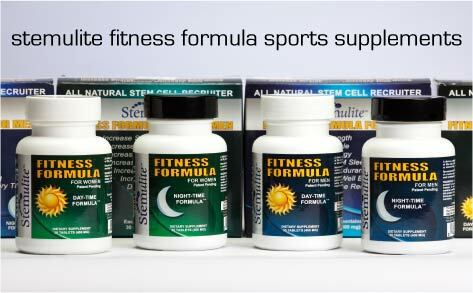 If you are looking for an effective and powerful natural dietary supplement that can complement your fitness regimen, Stemulite Fitness Formula will take you to the next level. For bodybuilders, athletes and fitness enthusiasts Stemulite Fitness Formula is essential because it gives your body the tools it needs to repair damaged muscle cells and prevents muscle cell and tissue breakdown after an intensive workout. Alpha lipoic acid and stem cell agonists boost muscle cell and tissue rejuvenation increasing strength, muscle size and definition. Stemulite also encourages protein synthesis and strong muscle cell growth. Stemulite repairs damaged cells in the body through the use of new adult stem cells produced from your own bone marrow while sleeping at night. A quality deep sleep is one of the many benefits to being on the program. Everyone knows how important a quality nights sleep is for the body’s recovery this is why Stemulite is formulated to provide the deep REM sleep required to make sure that the body can complete its natural muscle and tissue repair on a regular basis. If you would like more information feel free to call with any questions you may have at 541-997-6100 or click on Reviews for user testimonials or Ingredients to find out what's in Stemulite. Please click FAQ for additional information.